We’re so happy and everything is perfect. The weather’s just so splendid. Aren’t you just as happy as I am? Music ties into a lot of things in my life as many of the artists and songs are as much of a soundtrack to it as they are to the blog posts I create here. Sometimes I discover new musicians through YouTube just by looking up the videos for songs that I already know as the algorithm suggests them as they are similar. I’m not sure what I was looking for when I discovered the band Stories Untold but I decided to listen to their song “Happy” on a whim; I do not regret it for even a second and it’s this photo that is inspired by the song’s video so the idea is not necessarily mine but it is enough of a difference with the tools I have to work with in SL. Before I get too far into my thoughts, the thing that drew me to this song is that I can empathize with it as do many people most likely. Sometimes feelings get overwhelming and can show up for a day or so or wind up becoming a cluster until it finally subsides and what is considered to be “feeling normal” or “like yourself” happens. After I heard this tune I realized that the songwriter totally gets it, totally understands that it’s not as easy as it seems to talk about things. It could be hypocritical that at times I’ve expressed that talking to people when you feel a certain way can help but following your own advice is not as easy. Blogging definitely helps in a way because I can sometimes just let some of it escape and there is a bit of relief from it which is one of the reasons why I still do it and to a degree still enjoy doing it as well. Giving myself an opportunity to create with the skills that I do have and I’m always trying to learn something new all the time, I guess it acts as a bit of a poor man’s therapy session. In a related an unrelated note, the band I’ve put a bit of a spotlight on in this blog is playing their very last show in a few days which is a bit sad as well as after only two albums which both are really good (which is of course my opinion but I feel that fans of theirs agree). Things come into your life when they need to or you discover them at a time of need and I’m honestly grateful for it. Now to focus on my look for this blog, which is mostly a mix of old and new Deadwool items with an added touch of a paper bag over my head much like “Bad Bag Bob” as he is known in the video. 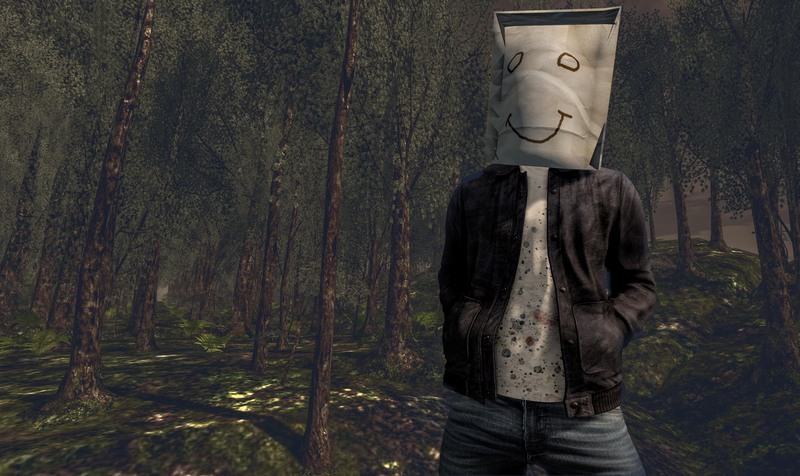 I did a look around the marketplace for paper bags worn on the head and the one I am wearing by Diabology was the closest I could find to the video. I probably could have just as easily just found a plan bag and just did a little post processing magic on it to make it look true to it but using creative license prevailed in the long run. As I mentioned at the beginning of the first paragraph, my look is a mix of both old and new Deadwool and those that visit this blog on any kind of basis will know that I don’t talk about older items and that I feature new things such as the “Suede Jacket” that is currently a part of the equal10 lineup for about another week or so. The detail of the jacket is fantastic and the options for it knock it out of the park as far as things go, there is one slight thing that I would have done differently. 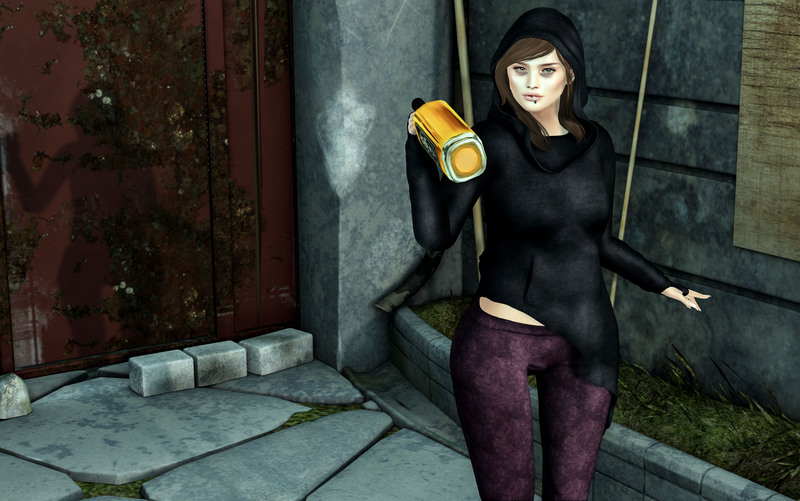 One thing that bothers me sometimes about clothes is that this jacket is structured with the arms stuck in a solitary position so if you wanted to use a specific pose it would not be very effect because it wouldn’t show any arm movement. Don’t let this deter you from potentially shopping for this item because aside from photography purposes, it’s definitely excellent fashion that deserves a spot in your wardrobe. Fitted for Belleza (Jake), Signature (Geralt and Gianni) as well as SLink Physique mesh bodies. Right now I am in between events and things so I will be putting together some looks with some of my brand partners to help with getting back on track after taking a couple days to just veg out and relax once Skin Fair ended. That was a really fun opportunity but also one I devoted lots of time and energy to thus requiring a little bit of extra down time. This weekend will also be what I consider my official blogiversary as my first solo post ever which was under the banner of the former title of this blog was made in 2014. Five years is something I consider to be a long time especially when it comes to devoting myself to it as a serious thing (not just like a time passer or hobby which is also fun too). I went from taking pics of me and everyone around me at the time (some of which are no longer around for whatever the reason may be). Most of my photography now is blog related and probably at some point I will scale back with the brands or events I blog for so I can take more photos that aren’t specifically for anything other than enjoyment. I am not at that point yet but the reality is that all things do eventually come to a stopping point. Will it be another 5 years? That’s not something I can honestly even say because the platform I’m working with may or may not be here but truth is that the logic in it was the same back when I started so I am just taking things a step at a time and making sure that I don’t let it become a chore (as if that becomes the reality then it is time for me to move on). I’d say possibly check back sometime this weekend to see if I’ve done a special post but I don’t want to make any promises that I cannot keep. Until then I hope you’ve been entertained and see you all again soon!